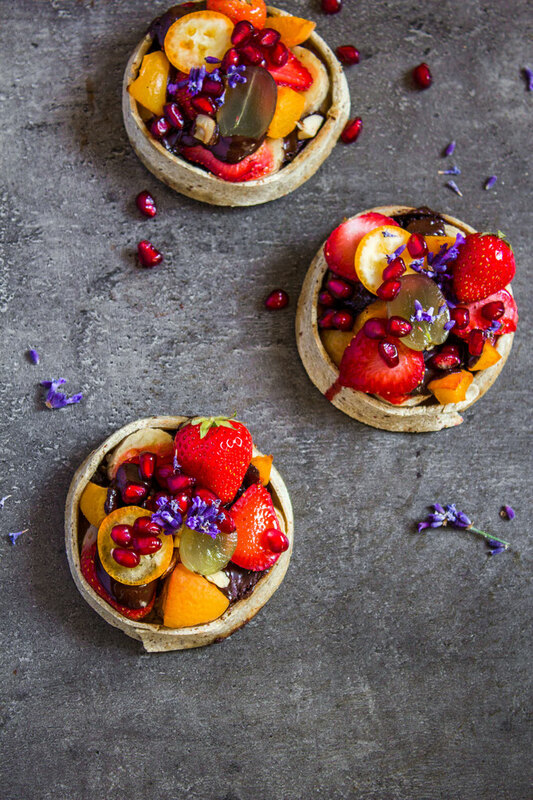 Fruit & Berry Tartlets - simply & healthy vegan recipes that taste amazing! 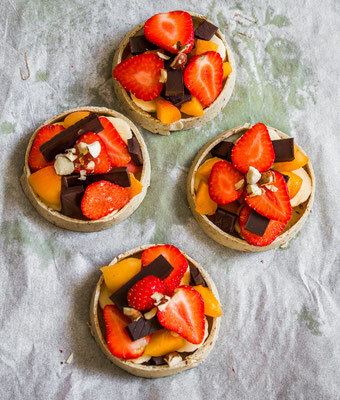 Simple gluten free vegan tartlets filled with berries, fruits and chocolate! 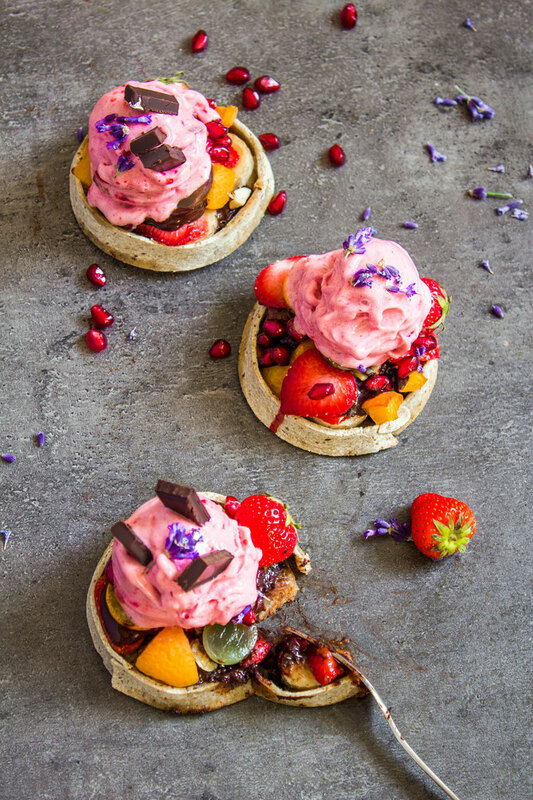 Simple Berry Tartlets without sugar, gluten or diary!! Sounds amazing? Thats what it is! To make it even more yummy, I added one scoop of lavender nicecream on each tartlet! HEAVEN! I am diving deeper into gluten-free baking and today I have something special for you. As I have told you in an earlier post, I sometimes just come up with something unique while I am creating something quite ordinary. And for those tartlets, that's exactly what happened. I was going to make a pizza (recipe coming soon), and suddenly I had made some tartlets instead! Those are truly brilliant as they are super easy to make and that gluten-free dough holds together perfectly! Lately, I am using psyllium husk for my gluten-free baking, and I am so amazed about its advantages. It makes the texture very similar to wheat flour dough, and has no taste at all! (Unlike flaxseeds that have quite strong taste when you blend it). Psyllium husk also has some great health benefits, but be careful to not overdose it! I really enjoyed filling my tartlets with a lot of fruits and berries. Inside you can find some sliced banana, chocolate, and some apricots. I also added some nuts for the extra crunch. When they were baked, I couldn't resist putting some more berries on top of that, and some fresh homemade lavender nicecream! What a dream treat guys!! Perfect for summer days! 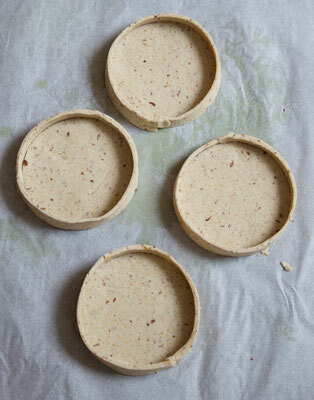 My idea with this tartlet base, it that you can use it for either sweet or savory tartlets. The dough is not sweet nor salty, but you could add any flavor to it if you wish to do so. Lets head over to the recipe! 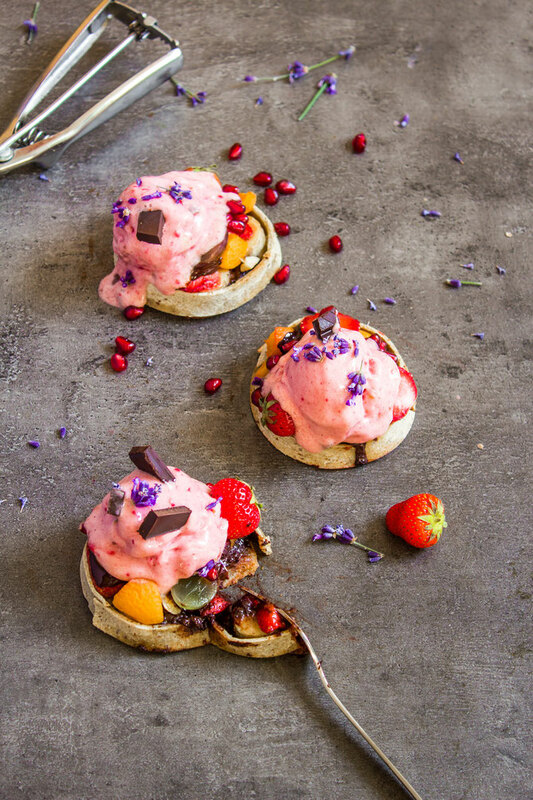 BERRY TARTLETS with chocolate and lavender nicecream! just a little lavender, try with just one or 2 small flowers at first and add more if you like a stronger taste. 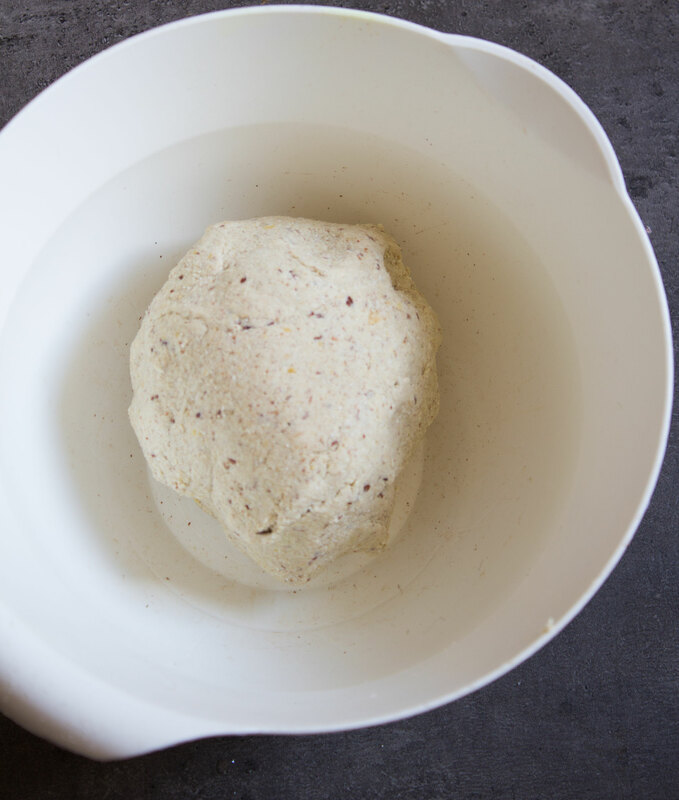 Blend the dry ingredients for the dough (psyllium husk, flaxseeds, buckwheat flour and chickpeas until you have fine flour or mass. Add the mixture in a bowl and add the water. Knead well for a couple minutes until it feels elastic. Then take about 3/4 parts of the dough and roll it out thin with a rolling pin. Use a glass or some kind of cup, and press it down on the out-rolled dough. Repeat until you have about 8 bases for the tartlets. Take the rest of the dough and roll it out with the rolling pin. Make it as thin as you wish, and cut out long stripes. Put together the ends on the stripes for each tartlet, so that you have the edges. See below. Be sure that there is no gap between the base and the edges. Use a little water on your fingertips to put together the base and the edge on each tartlet when necessary. Repeat for all the tartlets. Use the leftover dough for one more tartlet if needed. Preheat the oven to 200-degree Celsius. Add more berries on top and make the nicecream right before serving! Nicecream: simply blend the frozen bananas, berries, almond butter and a little lavender until you have a super smooth ice cream! Scoop on the tartlets and serve right away! Enjoy my recipes? Leave a comment below if you have any question!